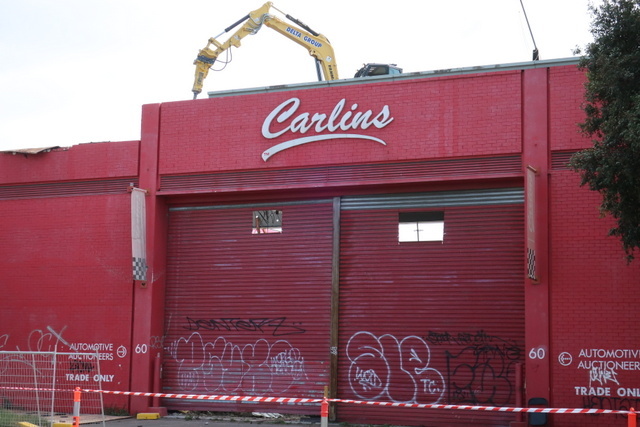 The former Carlins buildings are being demolished to make way for the first tower of Fifteeen85 in Montague, South Melbourne. 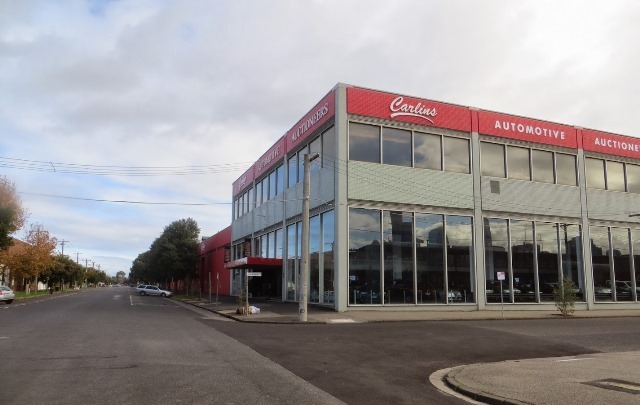 Carlins signature red, only louder, has been taken up by Sydney Tools down the road near the Port footy ground suggesting their confidence that there will be a lot of construction activity in the area. Work started on the outside edges of the site before proceeding to the showroom on the corner of Kerr and Buckhurst St. The showroom was all polished cars and plate glass windows until Carlins moved their operations to Brooklyn in April 2017. Once Carlins had gone, the showroom was briefly a gym before being occupied by squatters. 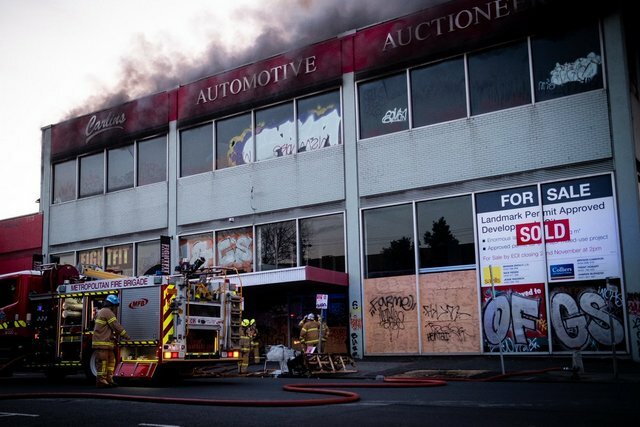 A fire damaged the showroom in August 2018 but it hung on. It had reached peak dereliction in the months before demolition began. No Rone in here to mourn its passing, but less well known artists found expression on the inner walls of the showroom. Looking for something else on the State Library of Victoria catalogue, I came across a series of four Wolfgang Sievers photographs showing the building created for McPherson’s machinery supplies. Seeing those photographs gave me a new level of interest in, and curiousity about, the site. The corner view that attracted me in 2013 is one of the views captured in his distinctive black and white photographs. McPherson’s started off importing hardware and machinery. In the pre-war period that also gave birth to the Wirraway, they transitioned to manufacturing the bolts, nuts, rivets and machine tools that were used to build the planes, munitions and later cars. Friend AM zoomed through the window of the SLV photographs. Rather than the graffiti I saw when I looked through the window, he could see the lathes, milling machines and surface grinders that he relied on when working at AMI (Australian Motor Industries) in Ingles St. The building was designed by Hassell & McConnell Architects which continues as HASSELL – an international trans-disciplinary design studio. Examples of their projects nearby include Tower 2 in the Melbourne Quarter in Docklands. In February, HASSELL and New York-based SO-IL were announced as the design team for the outdoor component of the Melbourne Arts Precinct Transformation project, which will connect the various arts spaces from St Kilda Road to Southbank and create welcome new open space in that precinct.